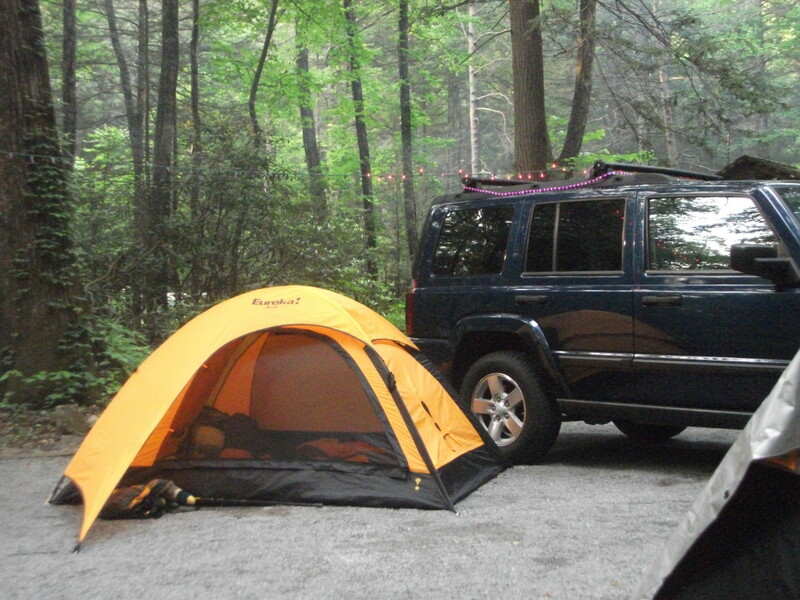 I grew up in a family who loved camping, except it was what people today call "rough" camping. My Dad's first "camping" vehicle was actually his own construction: a two-wheeled utility trailer into which he would throw a mattress for my mother and me (he would sleep in a sleeping bag on the ground next to the trailer). 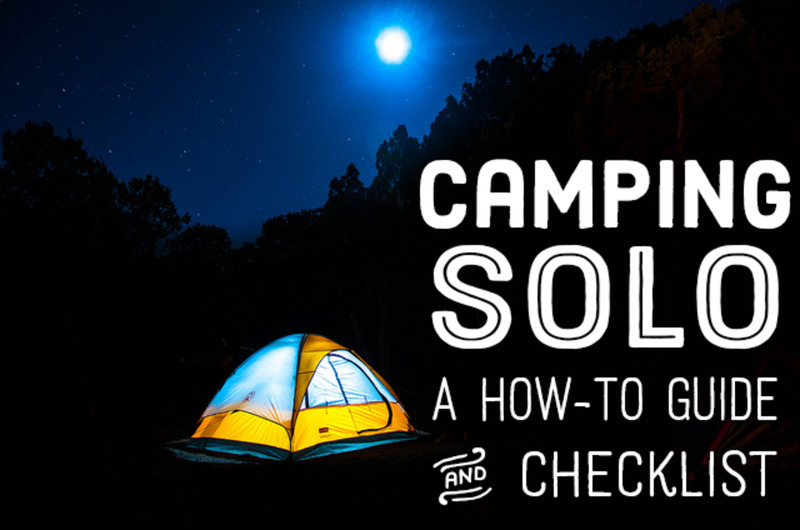 Eventually, he bought an Army surplus tent, a Coleman tent, a camper shell, and a truck camper. His last camping purchase was a 14-foot trailer. 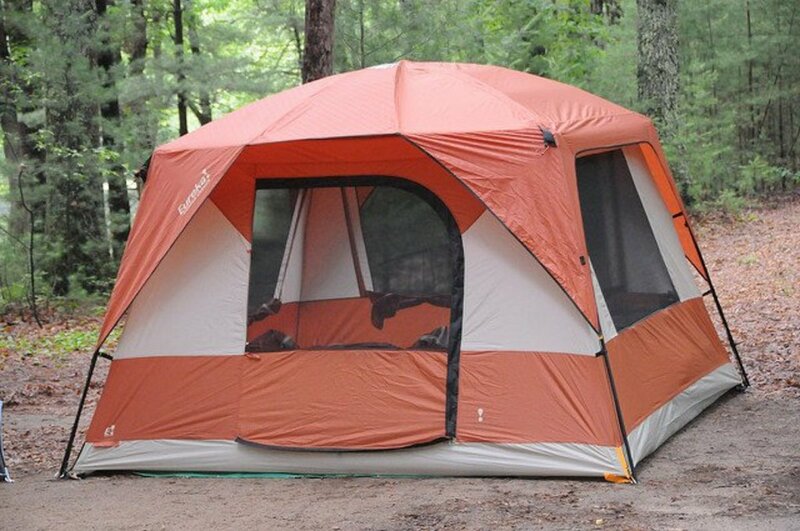 As young marrieds, my husband and I purchased a 5-person Coleman tent, a Coleman lantern and a Coleman stove. We usually slept in sleeping bags placed on air mattresses on the ground. Camp life revolved around "cowboy" coffee while sitting around a camp fire. One could chew the coffee and grounds. When our children had grown, we sometimes borrowed a converted van, but after that our camping days seemed to be behind us. 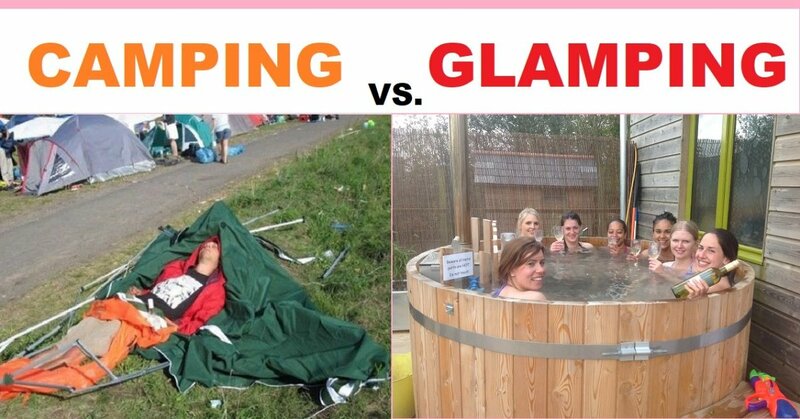 I had discovered the term glamping in an article in Sunset Magazine in connection with a company that provided yurts with wonderful amenities. 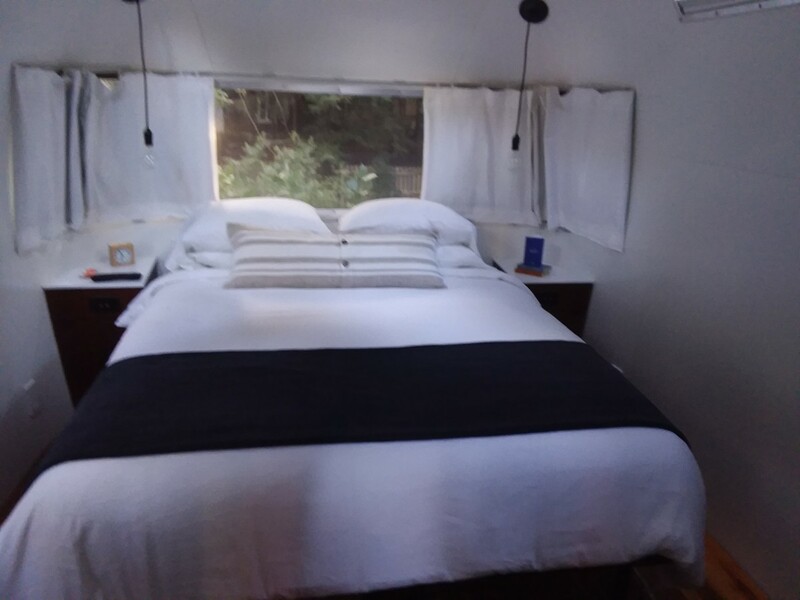 When our youngest daughter called to say she was going glamping with her husband in Northern California and had rented three nights near Guernville in Airstreams for both of us, we were excited. 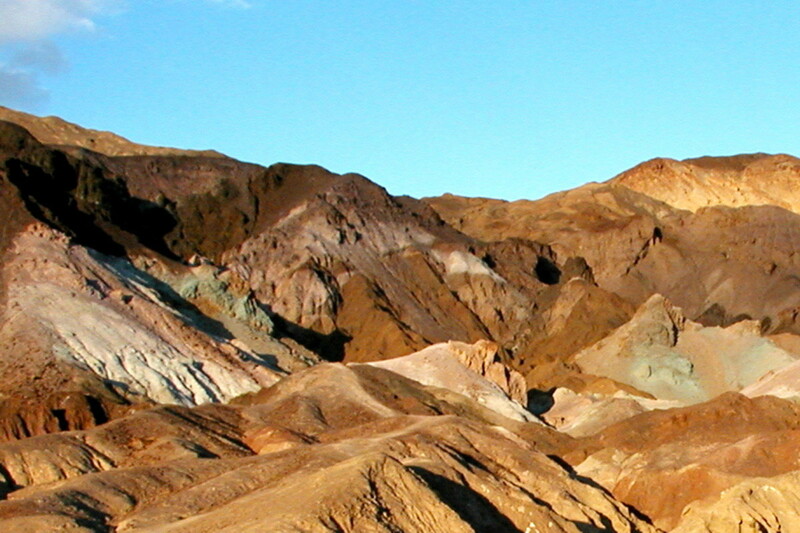 The company she had chosen was Autocamp, near the Russian River about 90 minutes north of San Francisco. After devouring a seafood lunch at Fisherman's Wharf in San Francisco, we took the winding Coastal highway instead of the freeway 101. The coastal highway has breath-taking views of the ocean, and is a paradise for bird watching, but it isn't for anyone afraid of heights without guardrails or who has a weak stomach. Upon our arrival at Autocamp, the desk agents were professional and friendly. We were given a few instructions, two approved fire logs (no regular firewood can be used) and the Airstream door codes. The grounds were surrounded by Coastal Redwoods and other trees, and there were several other grassy areas for lawn games. The cozy bed and linens were better than most hotels, and there was a flat screen TV, Wi-Fi, and Surround Sound. In the center of the Airstream was a complimentary bottle of wine, dishes for four persons, a bar sized refrigerator, a microwave, a sink,and a couch that pulls out, but no stove. Cooking must be done outside on a grill. Since Autocamp provides rolls, fresh juice, tea and coffee, and most campers are gone during the day, not having a stove wasn't important to us. The bath had a generous-sized shower, a toilet, and sink. The toiletries provided were spa quality. 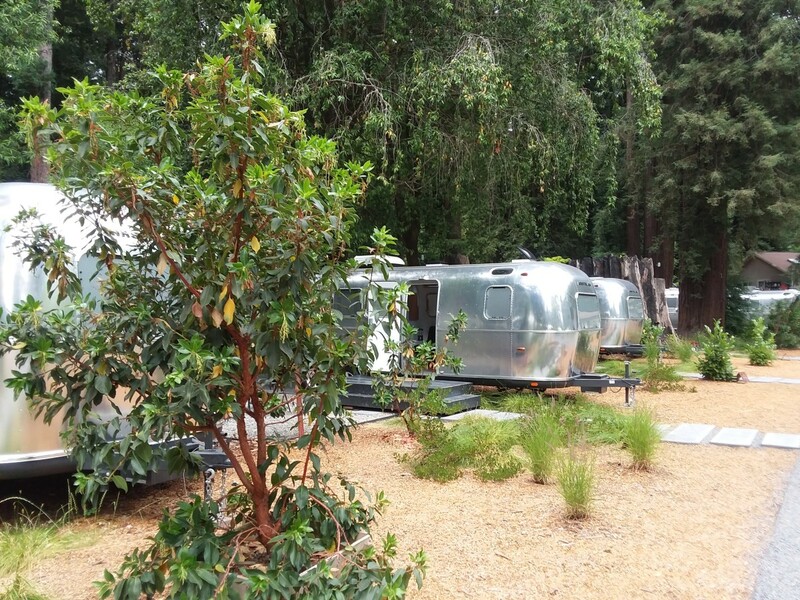 In addition to glamping in an Airstream, Autocamp offers large and small tents. 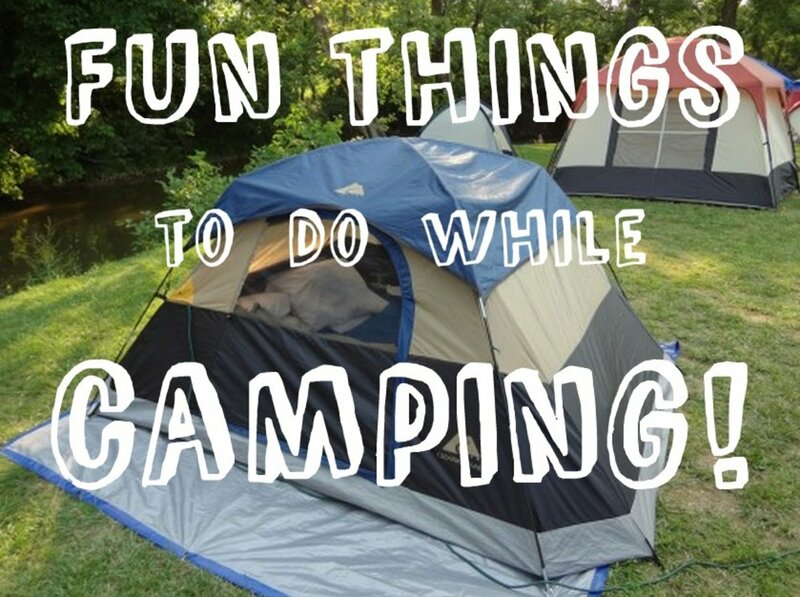 The tents have comfortable beds and furniture, but occupants must use the shower and toilet facilities in the reception area. Near the reception desk is an area for purchasing wine and other beverages, snacks, souvenirs and a few basic toiletries. Autocamp has bicycles, Ladder Ball, Corn Hole, and other indoor and outdoor games for guests. 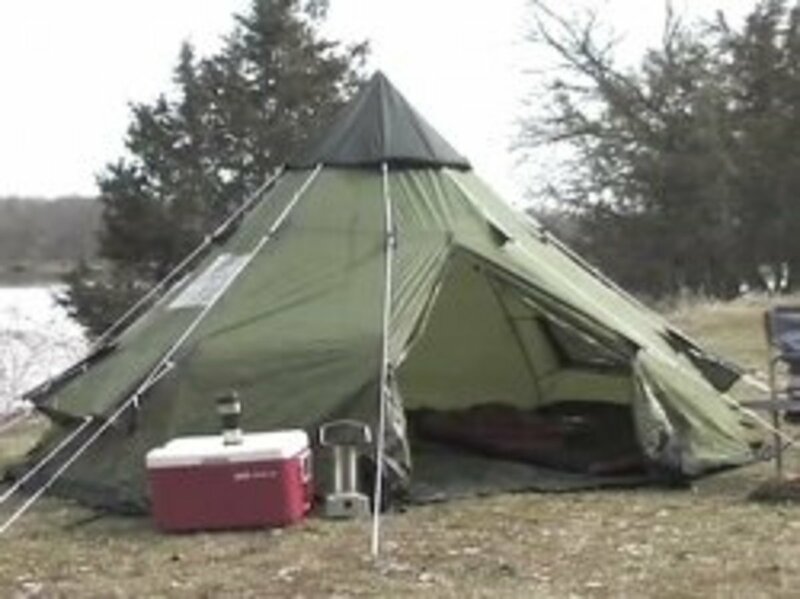 This is my idea of fine camping style. 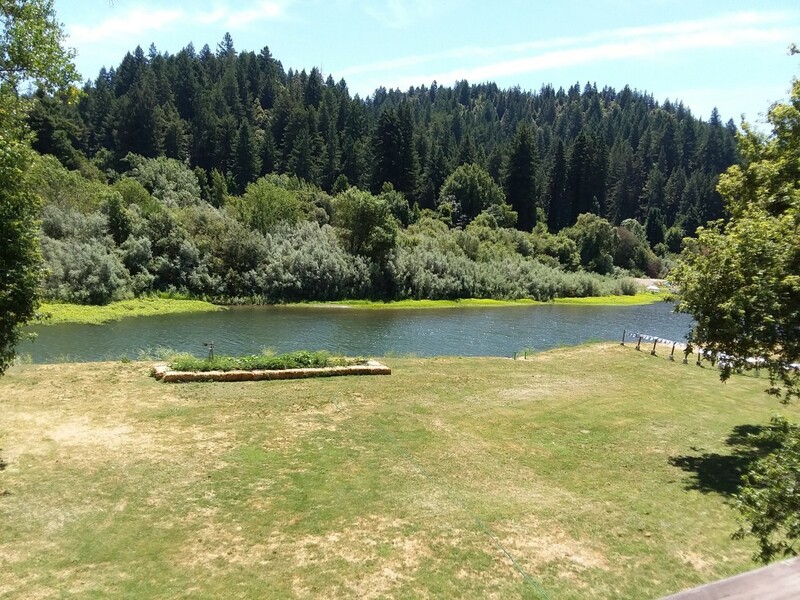 On our first full day, we visited the Armstrong Redwoods State Park, located three miles from the Autocamp. We enjoyed some casual hiking along the Pioneer Native Trail to the Parson Jones tree, the Icicle tree, and the Colonel Armstrong tree which is estimated to be 1,400 years old and 310 ft. tall. From the picnic area, we drove to the top of the park up a one-lane road to Frog Pond, again fantastic views at the top, but no guardrails. A funny (but sort of scary) thing was that when we came to the end of the road there really wasn't a pond, just a marshy area with a sign that said Watch for Rattlers. And sure enough, a rattler was slithering away from us next to the sign. Our "kids" spent the next day canoeing on the Russian River. Several places also rent kayaks and inter-tubes. 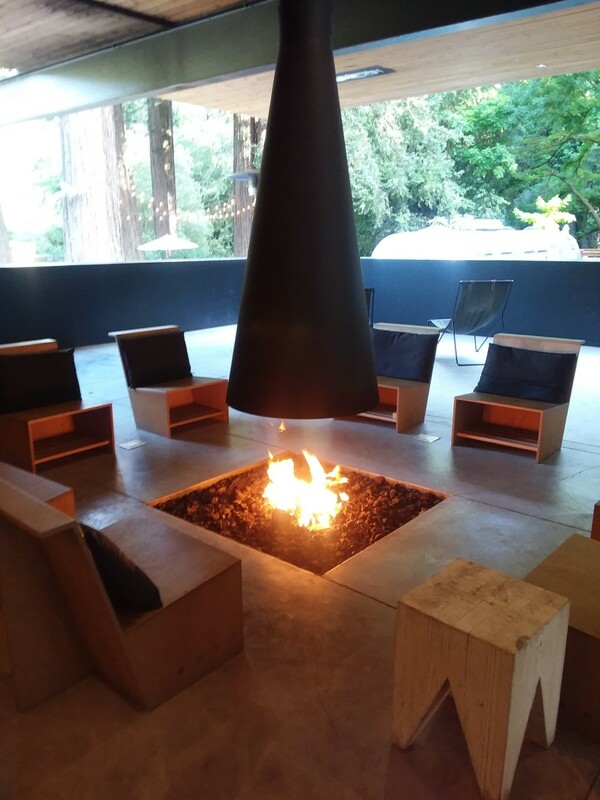 We explored the area of many wineries just north of Guerneville. 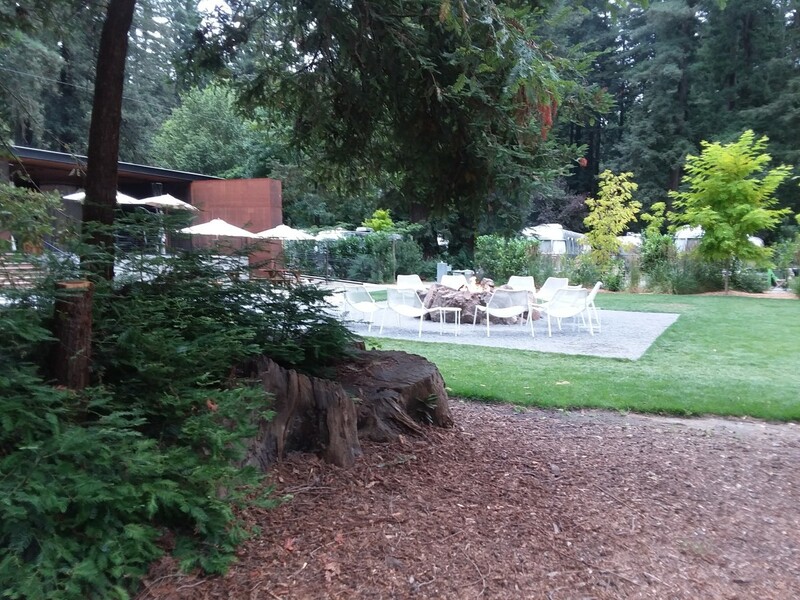 The largest is probably Korbel, which offers a tour and tasting area. The town of Guernville is geared to tourists and has a number of restaurants and bars. A Safeway is a good place for provisions. Who Can Argue With Some-Mores, Steaks and Good Conversation Around a Campfire? For our daughter's birthday dinner, she requested steaks, potatoes and salad, with some-mores for dessert. The steaks over the grill and salad were excellent, but the potatoes were overcooked in places and under cooked in others. Wait, this part was a good reminder of the potatoes we used to throw in the campfire with the same results. We took turns around the camp fire burning marshmallows on sticks for some-mores (Autocamp sells the kits) and telling old camping stories, which was always one of the best parts of camping and still is. By ten, since Autocamp has a quiet policy, we crawled into our deluxe beds for the last time. 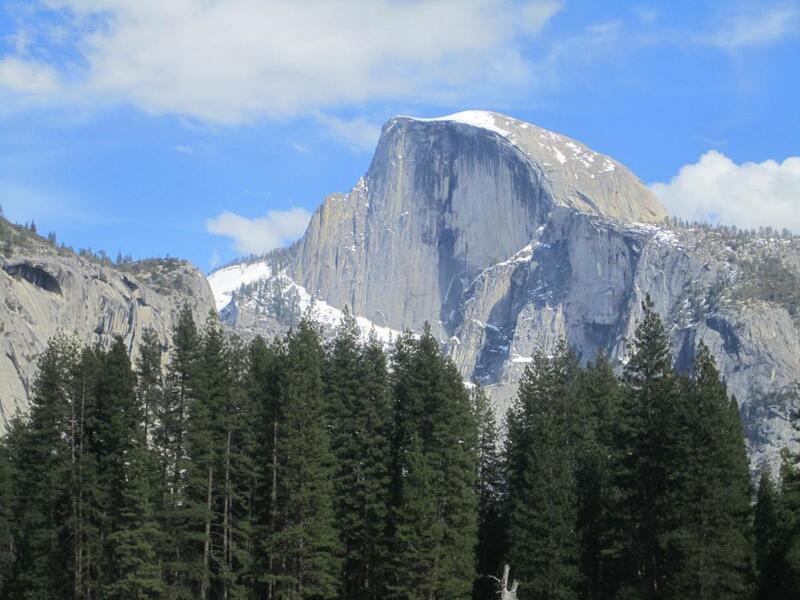 Autocamp offers two other facilities, one in Santa Barbara, California, and the other in Yosemite.